Orthodontics is the dental specialty which deals with the positioning and relationship among the teeth within the jaw. The orthodontic goal is to move the teeth into the best position, not only for appearance, but more importantly for proper chewing, swallowing, breathing and speech. Orthodontists use a variety of "appliances" as the metal bands and wires are called, and techniques to move the teeth into proper position. Teeth-straightening and extraction have been practiced since ancient times to improve the alignment of the remaining teeth. Orthodontics was a minor part of general dentistry until the nineteenth century. The focus of ancient and medieval dentistry was on extracting decayed teeth and discovering the causes and prevention of decay. The first detailed analysis of orthodontic technique was given in The Surgeon Dentist, published in 1728 by Frenchman Pierre Fauchard (1690-1761). The volume devoted an entire chapter to tooth irregularities and ways to correct them. Another French dentist, Claude Mouton, also wrote on the irregularities of tooth position shortly after Fauchard's work. In England in 1771, John Hunter provided scientific names for the types of teeth and gained experience in transplanting and replanting teeth. Orthodontics became a separate science in 1841 with the coining of the term orthodontia by Lafoulon. Again, a new book stirred the interest of the dental profession. This time it was J. M. Alexis Schange's volume on malocclusion (the abnormal fitting of the teeth in the upper and lower jaws). In 1858 Norman W. Kingsley, a gifted dentist and writer, made his mark on orthodontics with his Treatise on Oral Deformities. Another landmark work was J. N. Farrar's two volume set, A Treatise on the Irregularities of the Teeth and Their Corrections, which was profusely illustrated. Farrar was very good at designing appliances. It was he who suggested the use of mild force at intervals to move teeth. A brace mold. Orthodontists use a variety of appliances and techniques to move the teeth into proper position. Another influential figure in orthodontics was Edward H. Angle (1855-1930). Angle devised the first simple and logical classification system for malocclusions. This system is still used as the basis for orthodontic diagnosis. He divided malocclusions into three types: Class I, where teeth are lined up correctly from top to bottom, but are spaced too far apart, or are crowded together, or crooked; Class II, where the upper teeth stick out too far beyond the lower ones (usually called an "overbite"); and Class III, where the lower teeth are too far in front of the upper ones (usually called an "underbite"). 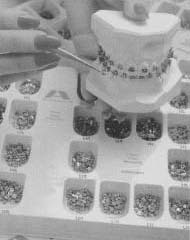 Angle contributed significantly to the design of orthodontic appliances and developed many simplifications. He founded the first school and college of orthodontia and organized the American Society of Orthodontia in 1901. In 1907 he also founded the first orthodontic journal. His highly-praised reference book, Malocclusion of the Teeth, went through seven editions. In addition to Angle's work in basic orthodontic developments, Eugene Solomon Talbot (1847-1924) began the use of X-rays for orthodontic diagnosis. The use of rubber elastic bands to move teeth was pioneered by Calvin S. Case and H. A. Baker. Today, orthodontics has become a popular procedure to improve a person's smile, even if there is no functional problem with the teeth. The braces and wires used to move the teeth used to be uniformly made of metal, and were not very popular with the young people who had to wear them for up to several years. In the last 15 years, though, the metal bands have been replaced with small brackets that are bonded onto the front teeth, greatly reducing the "metal mouth" look. Metal bands are still used on the back teeth, which are harder to move. The wires guide the teeth into the proper position. Thanks to improvements in materials and technique, braces can also be made of clear or tooth-colored ceramic materials, or applied to the inside of the teeth so they don't show as much. The wires can be made of new metal alloys (combinations of metals) that hold their shape better and reduce the time the patient has to wear braces. Other appliances include elastics and headgear to move the jaw into a new position, and retainers, which are used to keep the teeth in place after the braces are removed. Patients can even make a fashion statement with their braces by having some parts in different colors. The latest development is magnetic braces, where magnets are attached along the wires. These magnets can replace more visible and bulky items like headgear. 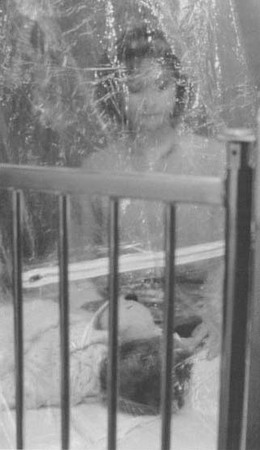 A mother visits her baby as it rests in a modern oxygen tent.